A unique feature of this chassis is the ability to adjust its height and, therefore, the clearance under its body by changing the angles at which the gearbox assemblies are mounted on the body. Interlocking teeth on the body and the gearboxes hold them in place and allow you to make adjustments in 5° increments by unscrewing a metal bracket inside the chassis, removing a gearbox, and reinserting it at a different angle. 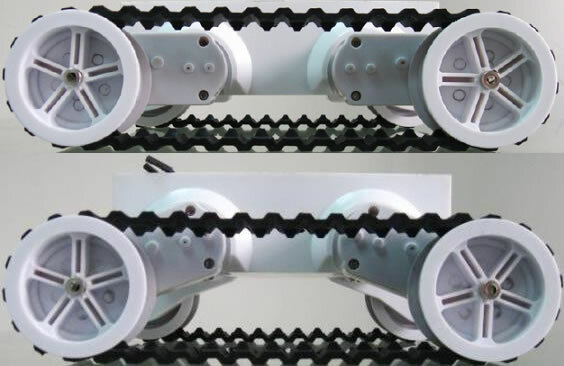 The elastic rubber tracks maintain sufficient tension with several different gearbox angles, allowing the chassis height to vary by nearly 1.5" (3.8 cm).